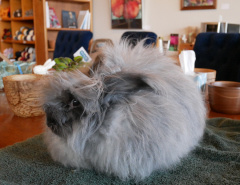 Benjamin is hoppy that spring time is here and we are celebrating by offering 50% OFF knitting classes in April! Benjamin is hoppy that spring time is here! and we want you to get a jump on knitting, so we are celebrating by offering 50% OFF new knitting registrations for classes in April! Discount applies only to class registration fee and does not apply to cost of yarn, materials, or other supplies. Limited spaces available.